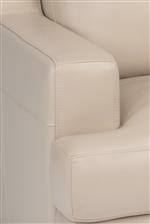 Meet your comfort needs and wow your guests with this contemporary style power sofa. The seat backs are adjustable, able to go from 20 inches deep to 31 inches deep allowing everyone to find the perfect fit for them. Each power mechanism features a single USB port so you can charge your phone or tablet without having to leave your favorite spot. Power to the USB port is activated only when the port in use. 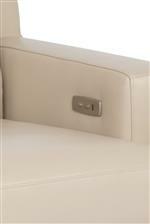 The Latitudes- Dowd Contemporary Power Adjustable Back Sofa with USB Ports by Flexsteel at Turk Furniture in the Joliet, La Salle, Kankakee, Plainfield, Bourbonnais, Ottawa, Danville, Bradley, Shorewood area. Product availability may vary. Contact us for the most current availability on this product. Seat Back Power mechanisms allow you to adjust the seat depth from 20 to 31 inches. 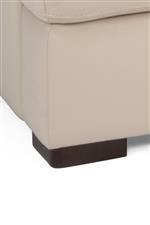 The Latitudes- Dowd collection is a great option if you are looking for Contemporary Casual furniture in the Joliet, La Salle, Kankakee, Plainfield, Bourbonnais, Ottawa, Danville, Bradley, Shorewood area.